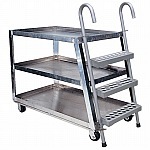 Vestil SPS2-2041-C Steel Cantilever Stockpicker Truck, Bottom Shelf Size (WxL): 20-1/2"x41"
Model: SPS2-2041-C, Bottom Shelf Size (WxL): 20-1/2"x41", Shelf Clearance: 28-1/4", Top Shelf Height: 35", Capacity Per Shelf: 110lbs., Bottom Shelf Capacity: 440lbs. Vestil SPS2-2236 2-Shelf Heavy Duty Extruded Steel Truck, Bottom Shelf Size (WxL): 22"x36"
Model: SPS2-2236, Description: 2-Shelf Units, Steel Construction, Bottom Shelf Size (WxL): 22"x36", Shelf Clearance: 27", Top Shelf Height: 35", Capacity Per Shelf: 550lbs. Vestil SPS2-2840 2-Shelf Heavy Duty Extruded Steel Truck, Bottom Shelf Size (WxL): 28"x40"
Model: SPS2-2840, Description: 2-Shelf Units, Steel Construction, Bottom Shelf Size (WxL): 28"x40", Shelf Clearance: 27", Top Shelf Height: 35", Capacity Per Shelf: 550lbs. 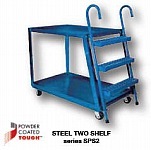 Model: SPS3-2236, Description: 3-Shelf Units, Steel Construction, Bottom Shelf Size (WxL): 22"x36, Shelf Clearance: 13-1/2", Top Shelf Height: 35", Capacity Per Shelf: 550lbs. Vestil SPA2-2236 2-Shelf Heavy Duty Extruded Aluminum Truck, Bottom Shelf Size (WxL): 22"x36"
Model: SPA2-2236, Description: 2-Shelf Units, Aluminum Construction, Bottom Shelf Size (WxL): 22"x36", Shelf Clearance: 27", Top Shelf Height: 35", Capacity Per Shelf: 330lbs. Vestil SPS2-2848 2-Shelf Heavy Duty Extruded Steel Truck, Bottom Shelf Size (WxL): 28"x48"
Model: SPS2-2848, Description: 2-Shelf Units, Steel Construction, Bottom Shelf Size (WxL): 28"x48", Shelf Clearance: 27", Top Shelf Height: 35", Capacity Per Shelf: 550lbs. Vestil SPS3-2840 3-Shelf Heavy Duty Extruded Steel Truck, Bottom Shelf Size (WxL): 28"x40"
Model: SPS3-2840, Description: 3-Shelf Units, Steel Construction, Bottom Shelf Size (WxL): 28"x40", Shelf Clearance: 13-1/2", Top Shelf Height: 35", Capacity Per Shelf: 550lbs. Vestil SPA2-2840 2-Shelf Heavy Duty Extruded Aluminum Truck, Bottom Shelf Size (WxL): 28"x40"
Model: SPA2-2840, Description: 2-Shelf Units, Aluminum Construction, Bottom Shelf Size (WxL): 28"x40", Shelf Clearance: 27", Top Shelf Height: 35", Capacity Per Shelf: 330lbs. Vestil SPS3-2848 3-Shelf Heavy Duty Extruded Steel Truck, Bottom Shelf Size (WxL): 28"x48"
Model: SPS3-2848, Description: 3-Shelf Units, Steel Construction, Bottom Shelf Size (WxL): 28"x48", Shelf Clearance: 13-1/2", Top Shelf Height: 35", Capacity Per Shelf: 550lbs. Vestil SPA3-2236 3-Shelf Heavy Duty Extruded Aluminum Truck, Bottom Shelf Size (WxL): 22"x36"
Model: SPA3-2236, Description: 3-Shelf Units, Aluminum Construction, Bottom Shelf Size (WxL): 22"x36", Shelf Clearance: 13-1/2", Top Shelf Height: 35", Capacity Per Shelf: 330lbs.